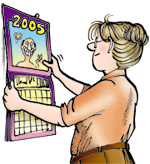 December | 2014 | FBorFW Strip Fix For Better or For Worse Comic Strip by Lynn Johnston. This entry was posted in Uncategorized on December 1, 2014 by stripfix. This entry was posted in Uncategorized on December 2, 2014 by stripfix. This entry was posted in Uncategorized on December 3, 2014 by stripfix. This entry was posted in Uncategorized on December 4, 2014 by stripfix. This entry was posted in Uncategorized on December 5, 2014 by stripfix. This entry was posted in Uncategorized on December 6, 2014 by stripfix. Lynn's Comments: How wild your imagination becomes if someone you love is late coming home. You're sure they're safe, but--what if? 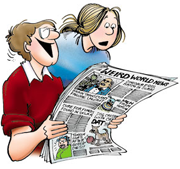 What if your family is one of those about whom the headlines are written? After all, it's the luck of the draw. Nobody is absolutely secure. Bad things can happen to any of us. In your mind, you go from imagining fatal accidents to acts of violence to kidnapping--all the stuff you see in the movies. Perhaps what we do is prepare ourselves for the worst. Maybe this is a good exercise, but it's often far too stressful and far too frightening. When folks ask how writers come up with so many weird ideas, I use the "missing at night" scenario to explain: Give yourself a situation in which you have no control, something that could go in any direction--this is when your writer's hat goes on. You want to resolve the situation now; you want to be able to handle whatever happens, and so you let your imagination loose. The next thing you know, you are in the mind of a writer. One small idea bubbles into another. Could there have been an accident? You visualize this awful possibility: the car, the people inside. Are they on a roadside? In the water? Soon, you're bringing in sirens--an ambulance and police to the scene. You go from imagining the accident to living through the aftermath: the hospital, the anguish, the lives on the line. You argue with nurses, you fight for the right to know. You call relatives and tell them the news. You wait for the recovery, or you plan for the wake. This is how a writer works; even though you're telling a story, you feel as though it's real. For a writer, imagination is a gift. For someone who is waiting and wondering, it's a nuisance. The good thing is, by the time you reach the most agonizing chapter in your imaginary scenario, your missing person shows up and you have nothing to show for your night of woe but relief. And--isn't that a great way for this all to end? This entry was posted in Uncategorized on December 7, 2014 by stripfix. Lynn's Comments: At this time, my parents lived in Hope, British Columbia. To get to North Bay was quite a haul: a two-hour drive to Vancouver, a flight to Toronto, and another to North Bay. With two kids, it was even more hassle for us to go to them. The few times we did get together for Christmas were much-celebrated events. This entry was posted in Uncategorized on December 8, 2014 by stripfix. Lynn's Comments: We were fortunate to have enough space that we didn't have to reorganize our sleeping arrangements. The game of musical beds was, however, good fodder for the strip. This entry was posted in Uncategorized on December 9, 2014 by stripfix. Lynn's Comments: Some of the names used here were Katie's friends. Other were kids that had bullied her at school because of the strip, so this was a way to include the local children and show that we wanted to include everyone we could, whenever possible. This entry was posted in Uncategorized on December 10, 2014 by stripfix. Lynn's Comments: I think I was in grade three when I was cast in a school Christmas pageant as a wise person. I was told to wear my bathrobe as a costume, but my mom was so upset by its frayed condition that she hurriedly made me a new one out of striped material--much like the robes worn in Christian-Hollywood flicks. Though my behaviour wasn't particularly saintly, I wore my pageant bathrobe for years, pretending I was right out of the Bible! This entry was posted in Uncategorized on December 11, 2014 by stripfix. This entry was posted in Uncategorized on December 12, 2014 by stripfix. This entry was posted in Uncategorized on December 13, 2014 by stripfix. This entry was posted in Uncategorized on December 14, 2014 by stripfix. This entry was posted in Uncategorized on December 15, 2014 by stripfix. This entry was posted in Uncategorized on December 16, 2014 by stripfix. This entry was posted in Uncategorized on December 17, 2014 by stripfix. This entry was posted in Uncategorized on December 18, 2014 by stripfix. Lynn's Comments: Aaron and my dad had a hard time playing board games. Aaron wanted to learn and Dad wanted to teach him, but they both wanted to win! This entry was posted in Uncategorized on December 19, 2014 by stripfix. This entry was posted in Uncategorized on December 20, 2014 by stripfix. This entry was posted in Uncategorized on December 21, 2014 by stripfix. Lynn's Comments: One of our traditions at Christmas was to clean out the fireplace. This was a good thing. We'd have forgotten otherwise. This is a pretty accurate illustration of our living room in Lynn Lake--complete with the crud on the rug. This entry was posted in Uncategorized on December 22, 2014 by stripfix. This entry was posted in Uncategorized on December 23, 2014 by stripfix. This entry was posted in Uncategorized on December 24, 2014 by stripfix. Lynn's Comments: This is something that didn't happen but should have. Brought up in the Anglican Church, I endured countless hours sitting through painfully dull sermons and kneeling as the litany droned on. I would have given anything to see a kid launch a toy down the aisle--and I'm sure the adults would have appreciated it, too! This entry was posted in Uncategorized on December 25, 2014 by stripfix. Lynn's Comments: It was fun to give Connie a new look. A big change in your life affects you mentally and physically, and it seemed to me that after ridding herself of the annoying Ted, Connie was renewed, refreshed, and recharged. This entry was posted in Uncategorized on December 26, 2014 by stripfix. Lynn's Comments: It seemed right to have Ted arrive, to see his lost love feeling great and looking spectacular. This entry was posted in Uncategorized on December 27, 2014 by stripfix. Lynn's Comments: This strip was missing for some reason. All we had in our archives was a newspaper clipping, and it had been edited down to fit into smaller format. Eventually, we did get our hands on a print with the top panels included. I redrew the whole thing (so Kevin could do the colouring and send it to the syndicate) and took the liberty of changing the punch line. What I wanted to do was connect "rat race" and "running through a maze" (like a mouse) with CHEESE! The original punch was weak: "We're having cheese". I mean, other than a rodent, who makes a meal out of just cheese? I think the new ending works better, but it's still a stretch! This is an example of when I had a workable idea but couldn't quite figure out how to word it! This entry was posted in Uncategorized on December 28, 2014 by stripfix. This entry was posted in Uncategorized on December 29, 2014 by stripfix. This entry was posted in Uncategorized on December 30, 2014 by stripfix. This entry was posted in Uncategorized on December 31, 2014 by stripfix.